Why study abroad in Egypt? Egypt will forever be the land of massive achievements. With an ancient civilization that dwarfs most others in the world, Egypt has been home to tenacious people who have left amazing monuments from the pyramids to the Sphinx. Even in ancient times, people traveled there to see the wonders that had been built. 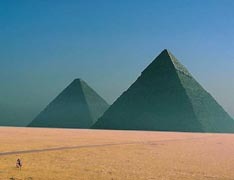 Today, Egypt stands as one of those modern nations that juxtapose their past and present in striking fashion. Modern edifices are jumbled together with small villages and the ruins from past ages, all set against the backdrop of the desert, Nile River and the famous Egyptian monuments. The accumulated wealth of art and architecture of thousands of years resides there. Prepare to be amazed! Enroll in Arabeya Language Center in Egypt and gain proficiency in the Arabic language. Direct enrollment program with Egyptian students for two courses selected from the general course offerings of six week summer session.